This past week is a prime example of life at its most hectic moments! The draft for this post had been sitting unfinished for more than 5 days before I finally finished it – unacceptable! I usually like to get a post published every 5 to 6 days so imagine my dismay when I was faced with two huge projects to finish at work before the end of the week. Lots of tea and spin class to de-stress definitely helped, but it got me nowhere with my writing. At last, it’s Saturday. I reveled in the fact that today, I was able to wake up slowly with no groans about repeatedly pressing the snooze button or thinking about my to-do list. It was fabulous. On the other hand however, I wish I had more pictures of this lovely dish. Of course, In the middle of everything else, charging my camera battery was last on the list. I managed to squeeze in two pics but ah I’m so disappointed. Last week, I chose to try a shrimp recipe because aside from chicken, shrimp is probably one of the most versatile ingredients to work with. It pairs well with pasta and almost any kind of sauce – alfredo, tomato, white wine, or a simple vinaigrette. Sear it quickly and it can make a great topper for salads or a nice addition to soup. I decided to try this recipe because it can be served two ways: as an appetizer, or as an quick weeknight dinner. This is definitely one of my favorite recipes yet! – rice, pasta, or neither! *For this recipe, I recommend using a non-stick frying pan. 1. Chop the spinach into thin strips (chiffon cut) and set aside. Next, heat the olive oil in a non stick frying pan on medium heat then mince the garlic. 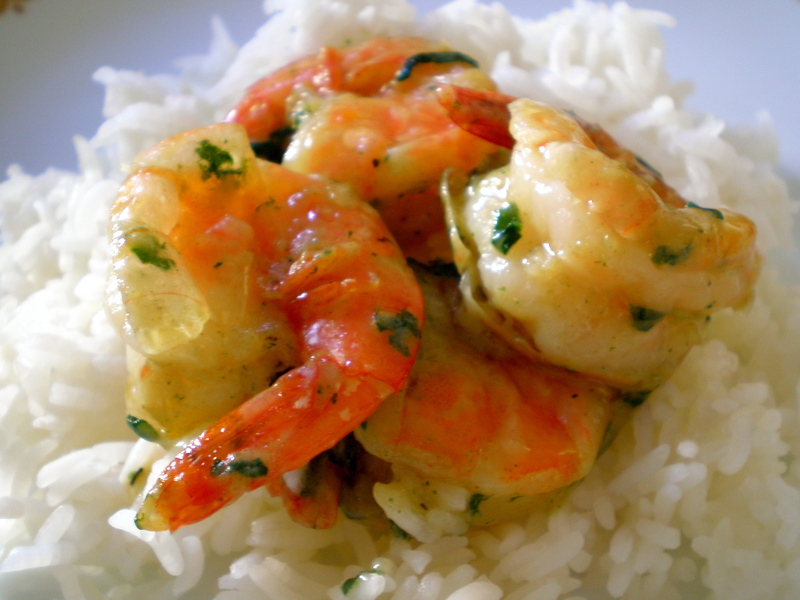 When the oil is hot, toss in the garlic and fry for about 30 seconds then toss in the shrimp. Season with salt and pepper. 2. Fry the shrimp for about 3 minutes then take it out and put it in another bowl. Be careful not to overcook because they will end up rubbery. Next, pour in the coconut milk. If you’ve never opened or used coconut milk from a can before, the water tends to separate from the cream so it will look like a watery mess when you first open it. Just give it a quick mix with a spoon to combine the parts equally before adding it to the frying pan. 3. Once you add the milk to the pan, increase the heat to medium-high and stir the milk briskly and constantly while it is reducing to prevent it from sticking to the bottom. Season with salt and pepper. It will bubble more and more as it reduces. The milk will reduce in volume and become thicker, like a sauce. As soon as it achieves a creamier, thicker, consistency dip a spoon in the pan. If your sauce coats the spoon, your sauce is done! Be careful not to over reduce the coconut milk. I did this before on accident with another dish and it is not pretty! The milk starts to separate and eventually evaporates, leaving only the oil and the creamy texture is lost! 4. Quickly, lower the temp to medium and toss the spinach into the sauce. Combine and stir spinach for about 3 minutes then add the shrimp. Toss the shrimp and spinach in the sauce for about 2 more minutes and you’re done! Serve alone as an appetizer or toss it with a little pasta. I chose to eat mine with hot jasmine rice but then again, I like everything with rice. For this recipe, I left the shell on, which is optional. It definitely makes eating the shrimp a bit more challenging but I don’t mind it. 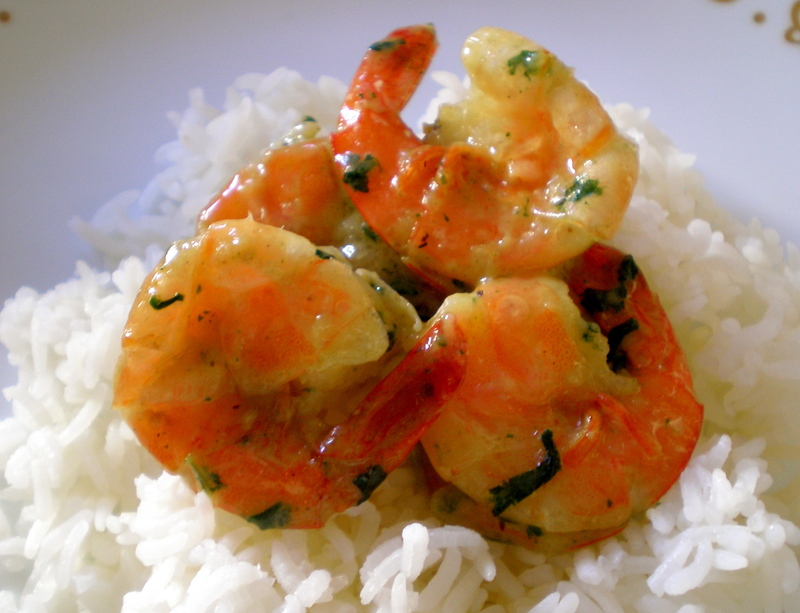 The creamy coconut flavor was full on from the first bite, but it wasn’t too strong that it overshadowed the delicate shrimp flavors. I like the sauce a little more on the salty, savory side so I added a bit more salt while the milk was reducing. Coconut milk has a naturally sweet flavor so add less salt if you want your sauce on the sweeter side. If you like spicy, adding a bit of sriracha or pepper flakes to the sauce gives it some nice heat. These little bites are so irresistibly good, I will have to make it as an appetizer next time! Yum! Def a great recipe for a week night. I will def try this out…maybe with some rice. Haven’t had any in a while! Thx for sharing! Most def! Rice is great with almost anything hahah. I am just now replying to these comments, shame on me! It’s been a busy week and I hope you write about your good eats while you were in NY! I’d cook for you any day girrrl. Thanks, Heather boo! One day I’ll post another Antonita-esque recipe hahaha if I’m brave enough! Ooh shrimp & coconut milk is so good! Add some curry in there, and you got yourself a tasty curry dish as well. OMG that IS tastyyyyyyy. You just made me drool. I love that you updated btw.